Tone controls for Guitar and Bass. 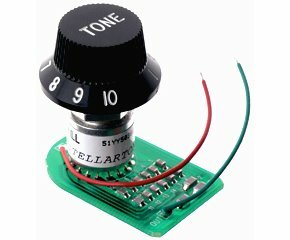 ed note: since this post was written, Stellartone has expanded their product line with even more tone enhancement items! How much do you actually use your tone control anyway? I might back mine off a little sometimes, but otherwise, it's usually just an extra knob that's in the way. The fundamental purpose of a tone control, is to provide tonal variation. Unfortunately, conventional tone pots typically only vary the tone from bad to worse. It's funny that with all the advancements we've experienced with guitars, effects and amps, these funky old tone pots are still standard fare in today's guitars. Acoustic guitars, on the other hand, are seeing quantum leaps. A better tone control (introduced at Summer '06 NAMM) now available. The ToneStyler direct replacement pot is a huge improvement over standard tone pots. Configured as a 16 position switch, each position utilizes a different and specific value capacitor, including a bypass position; taking the tone control completely out of the circuit. Why the knob pictured here has 10 positions, I haven't a clue, but who really looks at their guitar's knob settings? Amp, sure. Maybe, they just didn't feel much like manufacturing 16 position knobs too. Hey! Now there's a hot niche for all you budding young entrepreneurs out there... NOT! CLICK HERE for demo video difference between standard pots and Stellartone Tonestyler pots. Providing the best parts and hardware for tricking out your Strat. Product lines include: Allparts, Q-Parts, Stellartone, Lindy Fralin, TV Jones, Seymour Duncan, Wilkinson, Mighty-Mite, Fender, Gibson, Custom Shop and more. 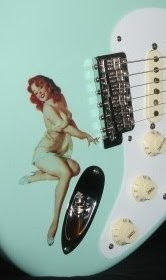 Be sure to check out TOG's custom prewired pickguard assemblies in several yummy flavors.